Passover the Tree of Life–Then what is the reality of the tree of life in the teachings of Christ? First what was the tree of life? According to the words of God, the tree of life gives eternal life when we eat of it. Then what did Jesus teach we should eat to live forever? In the Garden of Eden, when sinners could eat from the tree of life, they could live forever. In the verse above, however, Jesus teaches that anyone eats and drinks his flesh and blood and then they can live forever. Through this we can see the reality of the tree of life is the flesh and blood of Christ. Through the tree of life in the Book of Genesis as prophecies, God wanted to teach us the true tree of life, the flesh and blood of Christ. Then how can we eat and drink the flesh and blood of Jesus Christ? 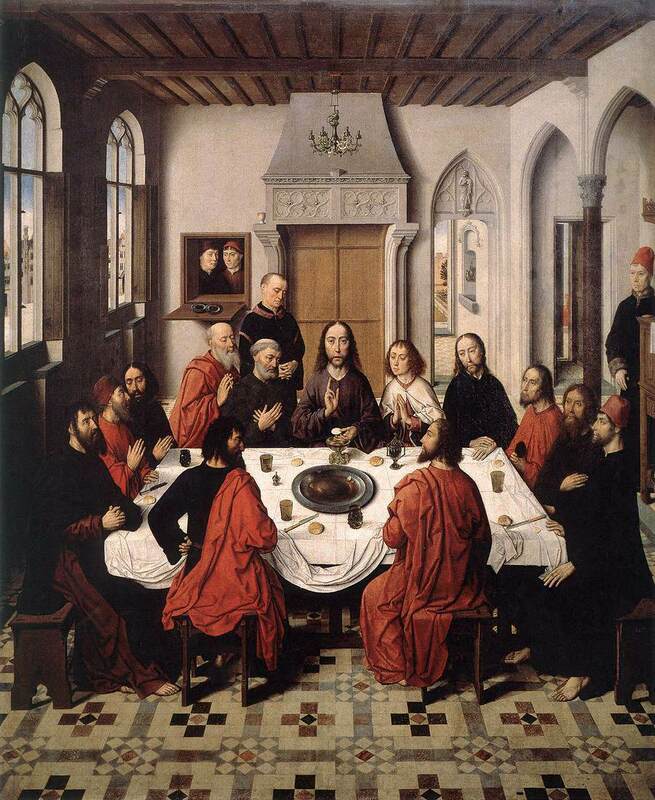 What is the Meaning of the Passover or the Last Supper as it was more widely known among people? Matthew 26:17 On the first day of the Festival of Unleavened Bread, the disciples came to Jesus and asked, “Where do you want us to make preparations for you to eat the Passover?” 18 He replied, “Go into the city to a certain man and tell him, ‘The Teacher says: My appointed time is near. I am going to celebrate the Passover with my disciples at your house.’” 19 So the disciples did as Jesus had directed them and prepared the Passover. Jesus and his disciples kept the new covenant of the Passover. Then how is the Passover related to the tree of life? Matthew 26:26 While they were eating, Jesus took bread, and when he had given thanks, he broke it and gave it to his disciples, saying, “Take and eat; this is my body.” 27 Then he took a cup (of wine), and when he had given thanks, he gave it to them, saying, “Drink from it, all of you. 28 This is my blood of the covenant, which is poured out for many for the forgiveness of sins. Passover the Tree of Life–Jesus kept the Passover with his disciples by eating bread and drinking wine. Jesus could have eaten a supper with bread and wine many times before. However, only on this night of the Passover did he give the special promise for the bread and wine. To the bread of the Passover, he promised this bread is my body or flesh. And also he promised to the wine of the Passover that this wine is my blood. Therefore, by eating and drinking the bread and wine of the Passover, we can participate in the flesh and blood of the Christ. By eating the flesh and blood of Christ we can participate in the tree of life. Therefore, the reality of the tree of life that we should eat from to live forever is actually the Passover. By eating the Passover we can participate in the tree of life and we can live forever. For this reason, for the most of the festivals of God the bible commands that we should KEEP them. But for the Passover, the bible says that we must EAT it. It is because the Passover ceremony allows us to eat the tree of life to receive eternal life. Matthew 26:17 On the first day of the Festival of Unleavened Bread, the disciples came to Jesus and asked, “Where do you want us to make preparations for you to eat the Passover? Luke 22:15 And he said to them, “I have eagerly desired to eat this Passover with you before I suffer. Passover the Tree of Life–2000 years ago, while people are under the agony of death, Jesus came to this earth and open the way to the tree of life through his flesh and blood of the Passover. And he gave the precious promise of eternal life through the Passover by saying, “Whoever eats my flesh and drinks my blood has eternal life and I will raise him up at the last day”. By establishing the New Covenant Passover, he opened the way to the tree of life. In this sense, who is Jesus? In the Book of Genesis, the way to the tree of life was blocked by God who place cherubim and a flaming sword. Whoever is unworthy tried to reach out his hands to the tree of life were put to death by the cherubim and flaming sword. Then if the way was blocked by God, who has the authority to open the way? It is only God, isn’t it? Passover the Tree of Life–Through this we can understand that Jesus was God himself who opened the way to the tree of life. He revealed the reality of the tree of life through the Passover. However, after the death of Jesus the way to the tree of life got blocked again because of sins of people. After the death of Jesus and his disciples, rather than following the commands of God, people accepted customs of man into the Christianity. And they disobeyed the commands of God. Because of their sin and lawlessness, the way to the tree of life was blocked again. For this reason the way to the tree of life was blocked again. However, by the grace of the second coming Christ Ahnsahnghong, the way to the tree of life is opened again. Christ Ahnsahnghong restored the truth of the new covenant of the Passover. And he opened the way to the tree of life through his flesh and blood again. Then who is Christ Ahnsahnghong? He is God himself who came as man in the flesh to fulfill the prophecies of the bible. Passover the Tree of Life–Now let us listen to the teachings of Christ Ahnsahnghong and eat the Passover. By participating in the bread and wine of the Passover we can participate in the flesh and blood of Christ. By participating in the flesh and blood of Christ, we can eat from the tree of life. Unworthy we are, God allowed sinners eat from the tree of life to live forever out of love and pity for the sinners. 1 Corinthians 5:7 Get rid of the old yeast, so that you may be a new unleavened batch—as you really are. For Christ, our Passover lamb, has been sacrificed. 8 Therefore let us keep the Festival, not with the old bread leavened with malice and wickedness, but with the unleavened bread of sincerity and truth. This entry was posted in Teachings Of Christ Ahnsahnghong and tagged God the Holy Spirit Ahnsahnghong, God the Son Jesus, Jesus' flesh and blood, Parable of Tree of Life, Passover, Passover the Tree of Life, the Reality of Tree of Life, the Way to Eternal Life, Tree of Life. Bookmark the permalink. It’s a good article that makes me realize how important the Passover is. Thank to Christ Ahnsahnghong and Heavenly mother for bringing back the Passover with sacrifice and love. Receiving eternal life on this earth! It’s NOT impossible. Moreover, whoever wants this will live for ever and ever in heaven’s kingdom. It’s none other than the Passover of the new covenant. However, those who do not trust the Bible will fail to receive this great blessing from Elohim God! This article makes me realize that only God can reveal the reality of the tree of life through the Passover. I appreciate it. Wow~ The reality of the tree of life is the Passover of the new covenant. To get eternal life we must eat and drink of the Passover’s bread and wine. Only God gives us the Passover. So Christ Ahnsahnghong restored it in this age. The Passover? I thought it was just in the old testament. The tree of life in Eaden is the Passover. Christ Ahnsahnghong brought us the passover in this age. so He is God. Through this article, I was very moved by the fact that all the things in the bible have to do with letting us know our Savior and the truths for our salvation. Really amazing! I do agree that this article says about the absolute truth which is closely related with the matter of our salvation and eternal life. Actually, only God has eternal life and therefore only He can open the way to the tree of life so that we sinners can eat of it and have eternal life. Then, who allowed us the reality of the tree of life, the New Covenant Passover? He is none other than Christ Ahnsahnghong. He is the Second Coming Jesus and the very true God that we have been waiting for. We must keep the New Covenant Passover for getting eternal life not the holy Communion. Bcz only bread n wine that we partake on the Passover night have God’s promise n become God flresh n blood. The restoration of the Passover, the truth of eternal life that has been forgotten for thousands of years, is also possible for God to come. To restore the Passover, God’s noble blood and sacrifice are necessary. The fruit of tree of life in the garden of eden is passover bread and wine which is Jesus celebrate. We can not eat fruit of the tree of life that is why God came down to the earth to save us. Thanks to God and Love you forever and ever. It is only the grace of God that He has given the tree of life to sinners again. The reality of the tree of life that’s blocked in the Passover of the New covenant. Only God can open the way of this thru the Passover. All thanks and glory to Christ Ahnshanghong who allowed us eternal life thru the Passover. There are many ppl who know about the fruit of the tree of knowledge of good and of evil, but not many ppl know about the tree of life. I hope that through this post, many ppl may realize why we must know the tree of life and Christ Ahnsahnghong! Jesus came with a the Tree of Life to get eternal life according to the prophecies of the Old Testament. Jesus said that the Passover is the tree of life in many times, but today people do not take it seriously. He is coming back and telling it 2000 years ago and this time. Only eternal life is for God alone. The human being who is killed by sin can not give eternal life. Let us give thanks to God who has pity for mankind and has granted eternal life to the Passover.